The end of the property boom? Page 7 today of the Financial Review. Two headlines on the same page. One reads, “Sydney, Melbourne property prices hit the skids” ironically written by Su-Lin Tan. And just below, “Don’t worry, house values wont crash” by Robert Harley. I’m confused. But this is what we’ve come to expect by mainstream media and today in the Fin Review, is a classic case of assessing the real estate market by looking in the rear-view mirror. Today, I give you some insider information as to what might be causing this confusion and a style of property that you MUST stay away from. Let’s get into it. How much blame can we lay at the feet of the government for the current slow down in Chinese buying? This week will cement one of the most important shifts in the property landscape of recent years. On December 1, the new regime for foreign investment into Australian property comes into full effect. These rules introduce new fees on foreign investment approvals and greater penalties for buyers that break the law, as well as any third-parties that help them do it – real estate agents, accountants and lawyers. The government seems to think that most of the action is with third parties, and fines of $45,000 for individuals or $225,000 for companies that knowingly help people break the law should cause people to stop and take stock. There’s been an amnesty in effect until now, giving foreign buyers who have broken the rules (typically by buying an existing property, which they’re not allowed to do) a chance to ‘fess up. A spokeswoman for the ATO said it had separately identified about 500 potential breaches of foreign investment laws it was investigating, a number of them from disclosures. “In our investigations across Australia we are seeing a range of properties, from apartments, to suburban houses, to waterfront properties worth tens of millions,” she said. Is this the end of the Chinese buyer boom? We don’t know how many of those 125 or 500 are Chinese nationals. It wouldn’t be all of them – some of the more high-profile cases so far have concerned Poms and Kiwis. But it’s likely to be quite a few. In recent years, the Chinese Buy has been one of the dominant themes in Australian property. The rise of the apartment investor has helped re-shape the inner cities of Melbourne and Sydney, with a bleed-over into Perth and Brisbane as well. And the trophy home purchases by Chinese Princelings has made it front page news. But there has also been a perception that Chinese buyers have been tapping our middle-range markets as well, helping fuel the booms in some of our major capitals. So is this the end of the road for the Chinese Buy? Has the government cooked the golden goose? I think in six months time, looking back at where we are now, it’s not going to be hard to tell that story. 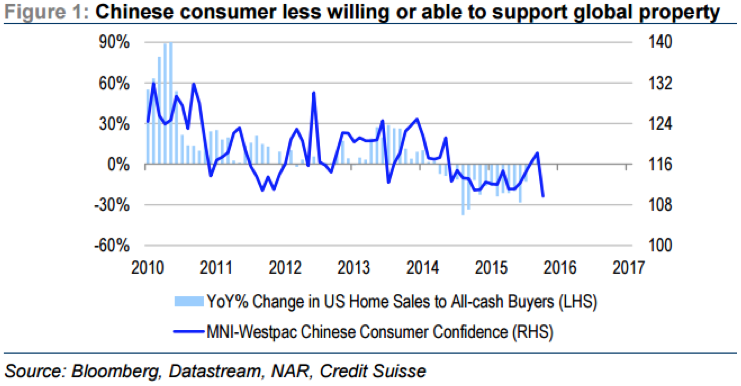 I think it is likely the 1H2015 will be the high-water mark for Chinese buying in Australia… at least for the time-being. And I think we will here a lot of complaints that the government was too heavy-handed and killed off the Chinese market. But I think the reality is that the Chinese Buy is being squeezed by two forces. The first is a tougher regime here – and personally I’m a fan. There’s no point having rules if the rules are being followed and enforced. It’s about proper market functioning. But the second squeeze comes from China itself. Partly that’s about a devaluation in the Chinese Yuan that’s giving the Chinese less purchasing power. But it is also about tighter capital controls, as the government tries to prevent a collapse in the currency and all their money escaping to sunnier climes. It’s hard to know exactly what’s going on on the ground, but that seems to be the consensus – it’s tougher to get money out of the country than it used to be. It’s difficult to know exactly what kind of effect this is having. Credit Suisse have an interesting chart though, looking at what’s happening to ‘cash-only’ buyers in the US. These cash-only buyers are probably not all Chinese, but it’s fair to say a good chunk of them are. And they find that this proxy for Chinese buying has been falling from a peak in 2H2014, with the pace of decline accelerating. And this seems to line up with anecdotal reports from auctions and so forth, that Chinese buyers aren’t as thick on the ground as they used to be. So it seems to me that the slow-down in Chinese buying is as much about tougher conditions in China as it is about a stricter regulatory regime here. But my prediction is that that won’t stop people blaming the government. So it will be interesting to see what happens to the off-the-plan apartment market (which aren’t affected by the new regime), and it will be interesting to see what happens to Chinese money when things settle down in China. I don’t think we’ve seen the last of the Chinese Buy. But when it returns the new rules will mean we know exactly what is going on. The government has done well on this one. Are you seeing fewer Chinese buyers on the ground where you are?